Found between 20° and 35° N and S latitude (warm temperate latitudes just outside the tropics); on the east coast in both hemispheres. Temperate Monsoon or China Type climate is observed in most parts of China. The climate is also observed in southern parts of Japan. Found in south-eastern U.S.A., bordering the Gulf of Mexico where continental heating in summer induces an inflow of air from the cooler Atlantic Ocean. Found in in New South Wales (Australia), Natal (South Africa), Parana-Paraguay-Uruguay basin (South America). Natal type is different from temperate monsoon or China type as it receives rainfall from on-shore Trade Winds all the year round. Characterized by a warm moist summer and a cool, dry winter (one exception: winters are also moist in Natal Type). 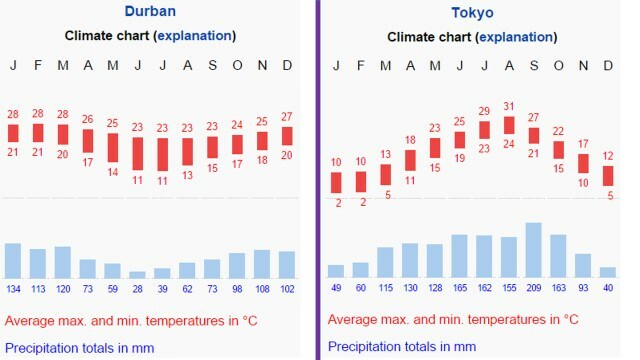 The mean monthly temperature varies between 4° C and 25° C and is strongly modified by maritime influence. Occasionally, the penetration of cold air (Polar Vortex) from the continental interiors may bring down the temperature to freezing point. Though frosts are rare they occasionally occur in the colder interiors. Rainfall is more than moderate, anything from 60 cm to 150 cm. This is adequate for all agricultural purposes and hence supports a wide range of crops. Areas which experience this climate are very densely populated. There is the fairly uniform distribution of rainfall throughout the year. Rain comes either from convectional sources or as orographic rain in summer, or from depressions in prolonged showers in winter. In summer, the regions are under the influence of moist, maritime airflow from the subtropical anticyclonic cells. Local storms, e.g. typhoons (tropical cyclones), and hurricanes, also occur. 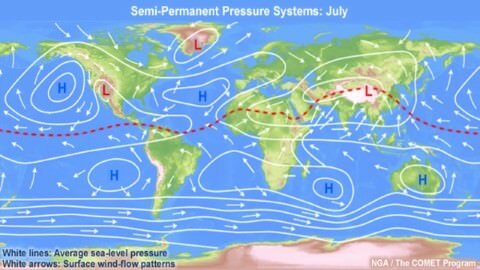 Intense heating within interiors (Tibet, desert region) sets up a region of low pressure in summer attracting tropical Pacific air stream (South-East Monsoon). Monsoon does not ‘burst’ as suddenly, nor ‘pour’ as heavily as in India. Typhoons form mostly in late summer, from July to September. In winter, there is intense pressure over Siberia and the continental polar air stream flows outwards as the North-West Monsoon, bitterly cold and very dry. There is little rain but considerable snow on the windward slopes. Another climatic feature associated with the China type of climate in southern China is the occurrence of typhoons. Monsoonal characteristics are less intense compared to China type. There is no complete seasonal wind reversal. Hurricanes occur in September and October. The narrowness of the continents and the dominance of maritime influence eliminate the monsoonal elements. The lowlands carry both evergreen broad-leaved forests and deciduous trees [hardwood]. On the highlands, are various species of conifers such as pines and cypresses which are important softwoods. Perennial plant growth is not checked by either a dry season or a cold season. The forests of China and southern Japan also have considerable economic value and include oak, camphor, etc..
South-eastern Brazil, eastern Paraguay, north-eastern Argentina have Parana pine, and the quebracho (axe-breaker, an extremely hard wood used for tanning). Eastern Australia have Eucalyptus forests. In Natal palm trees thrive. The Gulf states of U.S.A. have lowland deciduous forests. A third of the world’s rice is grown in China, though the huge population leaves very little for export. Monsoon China has all the ideal conditions for padi cultivation; a warm climate, moderately wet throughout the year, and extensive lowlands with fertile moisture-retentive alluvial soil, which if necessary, can be easily irrigated. As the flat lands are insufficient for rice cultivation, farmers move up the hill-slopes and grow padi on terraced uplands. Lack of population pressure and the urge to export gave rise to corn, cotton and tobacco. The humid air, the sunny summer and the heavy showers suit the crop well. It is grown right from the Gulf coast to the Mid-west south of the Great Lakes, with the greatest concentration in the Corn Belt of Nebraska, Iowa, Indiana and Ohio. The region accounts for more than half the world’s production of corn, but only 3 per cent of the world’s export. Apart from its ease of cultivation, corn’s most outstanding feature is its prolific yield. It gives almost twice as much food (mainly starch) per acre as wheat or other cereals. This explains why it is so widely cultivated in both the warm temperate and the tropical latitudes. Of the cash crops grown in the Gulf states, none is comparable with cotton. The Gulf type of climate is undoubtedly the best for cotton growing. Its long, hot growing season with 200 days frost free and a moderately high temperature permits the crop to grow slowly and mature within six months. In the very south, in the Gulf-lands, the heavy rainfall damages the lint. This area is therefore less suitable for cotton and is devoted to citrus fruits, cane sugar and market gardening, as in Florida. The commercial cultivation of cotton is now concentrated only in the most favorable areas which are the Mississippi flood plains and Atlantic coastlands. The most dreaded enemy of the Cotton Belt is the boll-weevil. The pest multiplies rapidly. The pest is responsible for the westward migration of the Cotton Belt. The humid atmosphere, the warmth and the well-drained soils of the Gulf states, enable tobacco to be successfully cultivated in many of the eastern states of U.S.A.
No less than half the tobacco that enters international trade comes from these states. In the coastlands of Natal, cane sugar is the dominant crop, followed by cotton and tobacco in the interior. Maize is extensively cultivated for use both as food and animal fodder for cattle rearing. In South America where rainfall is less than 120 cm, there is much grassland on which many cattle and sheep are kept for meat, wool and hides. The extensive natural pastures provide valuable forage for both cattle and sheep. Further north in southern Brazil, the rainfall increases to more than 120 cm and forest gradually replaces grass. Here the important occupations are the cultivation of yerba mate (Paraguay tea) and the lumbering of araucaria or Parana pine. Cattle and sheep are reared, and maize and cane sugar are grown. In eastern Australia, Giant eucalyptus trees rise one above the other right up the Eastern Highlands. But with the influx of European immigrants, much of the forest has been cleared for settlement and dairying. The eastern margin of New South Wales is now the chief source of Australia’s milk, butter and cheese, besides cotton, cane sugar and maize which are increasingly grown in the north. Give a reasoned account of any two of the following. Cotton cultivation in the United States of America. Padi growing in monsoon China. Give an explanatory account of any three of the following. Local storms (e.g. typhoon, hurricane, pampero) are often associated with the Warm Temperate Eastern Margin Climate. U.S.A. accounts for more than 50 per cent of world production of corn (i.e. maize) but only 3 per cent of world exports. Farming in monsoon China is usually on a subsistence basis, and the peasants are permanently ‘land-hungry’.